Ilas-Tei, an Argonian assassin, was one of Phinis Gestor's missing apprentices. 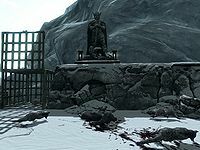 You will find him dead in the arctic reaches between Ysgramor's Tomb and Septimus Signus's Outpost, next to a shrine of Talos. His body is surrounded by skeevers (most of which are already dead). On Ilas-Tei's body you will find blue mage robes and Ilas-Tei's ring. 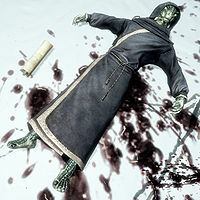 There is a Scroll of Fury near his body, as well as a Scroll of Calm closer to the cage. This grim scene suggests his death might be the result of an experiment that went terribly wrong. To the left of the cage are several barrels and wooden boxes. Here you will find a copy of the Alteration skill book Breathing Water. You will also find another Scroll of Calm and an Apothecary's Satchel. Ilas-Tei was to be included in an unfinished quest in which you are tasked with finding him and the three other missing apprentices. In the quest, you bring Ilas-Tei's Ring back to Phinis Gestor, who will say "Oh dear. I had particularly high hopes for her. Once she'd overcome her difficulties, she could have been quite successful here." The female pronouns also suggest that Ilas-Tei was at one time going to be female. If you pass the shrine and do not loot his corpse during your first visit, his body will disappear once the area respawns, making his ring unattainable if you are collecting the missing college apprentices' various items. This page was last modified on 30 August 2018, at 22:22.